The Teaching Press at the University of Wisconsin-Green Bay will premiere its first publication, a collection of poems by Tim Weyenberg, on Thursday, April 4, 2019 from 4:30 to 6 p.m. in UW-Green Bay’s Cofrin Library, Room 125D (ground floor). This event is free and open to the public. 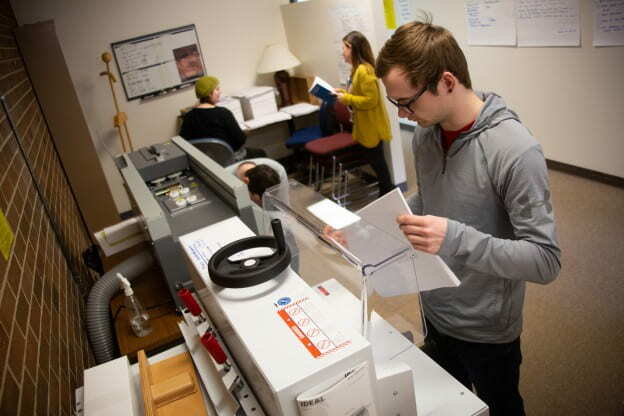 The Teaching Press is a brand new, student-managed printing house on the UW-Green Bay campus, currently being built from the ground up by undergraduates in a spring 2019 “Book Editing Practicum” course. The Press’s mission is to showcase voices in the Northeast Wisconsin region and welcome authors of all fields and origins, while providing hands-on learning opportunities for undergraduates to learn transferable skills in a variety of interdisciplinary fields, including English, business, and graphic design. The Press’s first book, Tim Weyenberg’s, “The Village and the Vagabond” will be fresh off the press and available for purchase. Weyenberg will read and discuss his writing as well. Attendees will meet the Press staff, including Press Director Prof. Rebecca Meacham, learn about the history and vision of the Press, and be guided through making a book of their own. Tim Weyenberg is a retired CEO and current University trustee. He is the University’s first named Executive-in-Residence for the Cofrin School of Business. Weyenberg’s poetry draws inspiration from the Wisconsin landscape and his youth, as well as his relationship with his wife of 50 years and essential friendships throughout his lifetime. Several poems are accompanied by sketches hand drawn by Weyenberg himself. For more information, please contact Rebecca Meacham at meachamr@uwgb.edu, or visit The Teaching Press Facebook page: https://www.facebook.com/uwgbteachingpress/.